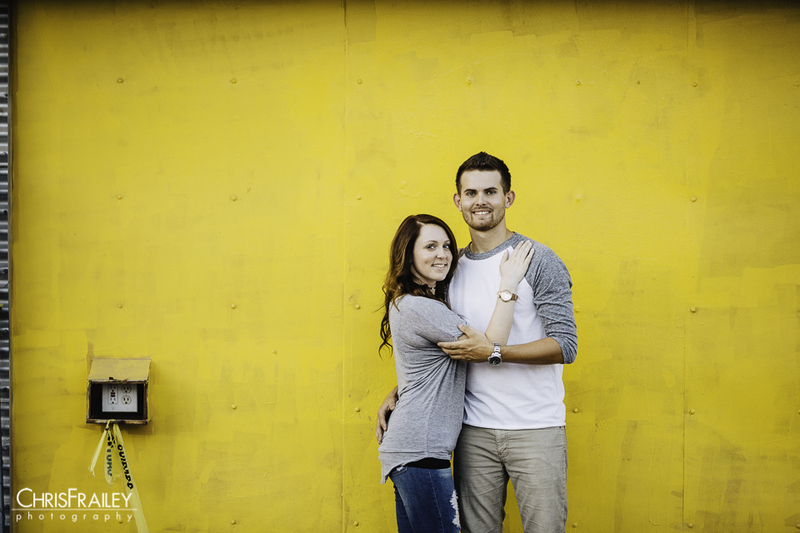 Having your engagement shoot at Roosevelt Row means only thing, a fun filled afternoon running around downtown Phoenix. The famed art district area of central Phoenix never disappoints on offering up plenty of colorful combinations. When I first started emailing Jenn about engagement photo locations, she quickly chimed backed with “we want something different than the traditional desert look”. One of the things I love about my clients is that they own the whole wedding process. It’s great seeing couples wanting to do things different than what everyone else does. I get no greater satisfaction as a photographer than helping them get exactly the look they want for their images. I offered up several locations around Phoenix that was not the typical desert look. Jenn and Shawn immediately came back with Roosevelt Row as their choice. My excitement jumped when I read their choice. Taking my clients into gritty, contrasting locations is my happy place. Jenn and Shawn were absolute troopers as we walked down back alley ways that looked less than desirable. Of course this paints a grimmer picture than what the Roosevelt Row area actually is with regards to its charm. Its “dark graffiti” appeal is what draws clients and photographers from all over the valley to shoot there. The eclectic stock pilings of junk only add to one’s options for photographs. These two truly fall into the Millennial category. Their “how we met” story is rooted in Instagram and a hashtag of course. Jenn had posted a photo on Instagram and Shawn happened to see it because of a certain hashtag (what could it have been?). Shawn commented on the photo which led to exchanging of phone numbers to texting. After exchanging numbers and texting until 4 AM, they met in person four days later on June 18, 2013 and have been together ever since! And who says the Internet is a waste of time!! Of course the only thing that gets me more excited than rad clients is, rad clients that bring their dog to their session! Scout was such a good doggie. We immediately hit it off, has it was obvious I was a dog lover. We wrapped up the evening making our way around all the gorgeous colorful backdrops. Jenn, Shawn, and Scout were just awesome. Their wedding is this December and I can’t wait to capture their big day. Below you will find a few more of my favorites from their engagement shoot at Roosevelt Row. Are you recently engaged? Thinking of popping the question? Be sure to look over my wedding guide to find a collection that fits your need and budget.